The Mint of Finland has announced that sculptor Reijo Paavilainen’s entry “Depicted in Form” has won the design competition for the upcoming “Kaj Franck and industrial art” collector coin. 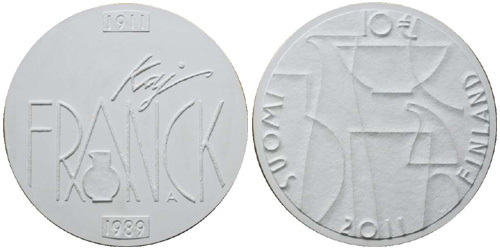 On November 9, 2011, one hundred years will have passed since the birth of designer Kaj Franck and in celebration of this anniversary, a 10 euro silver collector coin will be issued in January 2011. Kaj Franck (1911-1989) was one of the leading figures of Finnish design and an influential figure in design and applied arts between 1940 and 1980. The Jury considered Paavilainens’s proposal to be a design where “tri-dimensionality” was well achieved. The Kaj Franck and Industrial Art coin will be struck in .925 silver with a weight of 33.6 grams and a diameter of 38.6 mm. No information is yet available on the mintage for proof and FDC examples.